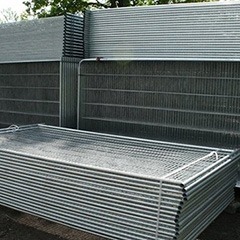 We can supply you with the right temporary fencing for your next project. Highest quality fencing from just £5.50+VAT per panel for a week. Equipment worth more than £1 million is stolen every year from construction sites in the UK. A chilling statistic. You may think temporary fencing is costly. But think again. Firstly, it may well pay for itself in the long run. Secondly, like lots of other construction equipment, it can actually be hired at very reasonable cost. Panel hire is perfect for a short-term project; you don’t have to buy it, and you don’t have to worry about storing it when it’s not in use. Of course, CCTV or a 24 hour security guard would be nice. But both can be expensive. Security Fence hire for either short-term or long-term projects is much cheaper, but extremely effective. Security and safety have to be given top priority on modern construction sites. Contractors not only have to protect their workers and their equipment, but make sure the public can’t get access to sites and injure themselves. Damages claims can be expensive! Bored youngsters can treat a building site out of working hours as an adventure playground, and that is highly dangerous. With mesh hording hire you keep children away from the site. Heras fencing hire also prevents opportunist theft, a growing problem in the construction industry. You won’t arrive one morning to find with a sinking feeling that your hard-earned equipment has disappeared. Security panel provides a real deterrent to passing thieves. Hire is easy and not as costly as you might think. 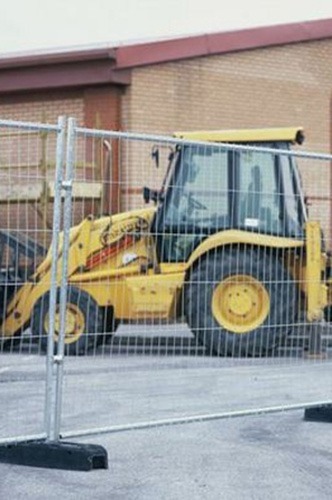 The best temporary fencing hire choice is probably the Heras fences, which is the mesh you see round most building sites, thousands of miles of it everywhere in Britain and across much of Europe. The answer is that, although it’s cheap to hire, quick to assemble and easy to move about, it provides the ultimate security and protection. It’s super-strong, durable and impossible to climb. Suitable for nearly all types of building site, heras fencing is so effective that it is used at music festivals, sports events, race meetings, shows and film sets. 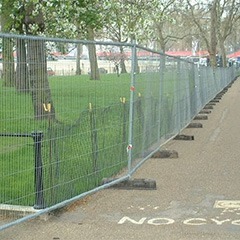 Security barrier hire is ideal, in fact, wherever you need to protect the public and prevent illegal entry. No special skills are needed. Temporary security fencing comes in panels and can be assembled in minutes, providing a secure site in next to no time. It complies with all the health-and-safety regulations. It’s easy. A quick phone call, and your temporary fence will be on site next day, guaranteed. We’ll gladly advise on the best type to suit your needs. Please call for more details on temporary fencing hire.